I'm continuing my digital work on this piece. It's a slow process. One that reminds me how much I need a stylus. I started working on this while watching two movies last night. The first was "How To Cook Life" and the second "10 Questions for the Dalai Lama". Both very interesting and set in a non-typical documentary style. There are some differences. The version I saved last night compressed and I lost my layers so I had to start over for the most part. 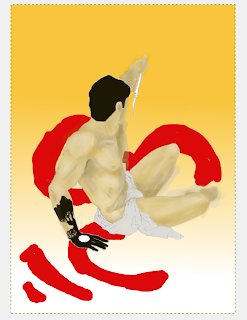 I'm happy about how the tattoo is coming along but the symbol needs to be reworked. Body shading and coloring is a struggle in and out of the digital world. If anyone has a tip on how to render it better please share!